Felicitations- you have inherited a great fortune. 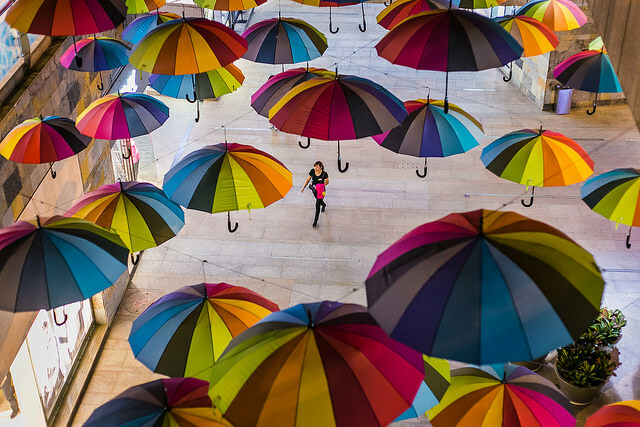 It takes the form of books, journals, databases, films, music, and maybe a few umbrellas (yes, I mean literal umbrellas). That’s because a great collection provides what people need, and so whether your collection is big or small, established or infant, budget-intensive or built on donations, you are the inheritor of a great collection - even if you can’t see that yet. I urge you now and always to consider the splendor, eccentricity, and charm of your library’s collection. You may fall in love. I have done so many times. Being a collection development librarian is appreciating, improving, and attending to your magnificent inheritance. I say “yours” and I mean it. While others will have pieces, and while your collection will be developed in service of your community, you will be the one who sees it holistically rather than in individual experience. This part of the work is a responsibility and a privilege. I say yours, but I also mean “theirs” and “ours,” because your collection is a generous thing, built for sharing, inspiring, and celebrating your community. This part of the work is a true joy. I encourage you to ask your coworkers why there is an extensive collection of monographs on flora and fauna of the Southwest or Hungarian Festshriven [Editor’s Note: there was a very old book about domestic breeds of cattle in the first collection I ever managed. We never figured out why it was there in a small, liberal arts college library, but we all fell a little in love with it and kept it.]. There will always be an answer, though sometimes no one will remember it. In such cases assume the answer is that your predecessors were trying their best. The longer you are in it, the more familiar the collection will become, but it will never be less weird than it is on the first day, and it will be weird. Maybe you will be particularly lucky and it will be SUPER WEIRD. Explore your collection- your inheritance- and remain grateful for it. Because the collection is going to make demands of you. There is maintenance, planning, management, and development. The collection is alive to need; and, as a result, the responsive collection can be at times unknowable. You will never get to focus on just an inventory or a weeding project. As you hone in on necessary maintenance, you will also be helping to grow the collection to meet the needs of your community and getting to know that community. It will be challenging to track what the collection was and what it is becoming, but you will try your best, and you will succeed. You will develop your rhythm of activities. There is so much pride to take in your inheritance, which will move and inspire people who use your collection. They may produce scholarship or art or other cool things, and then you can collect what they make. Those people are also inheritors in their way- they share your inheritance and benefit from your stewardship. And sometimes, people will be annoyed to find that their something specific isn’t in there. You will receive angry emails, and you will not always meet expectations. The collection will be imperfect and serviceable. It is a great collection if you find that people are more often satisfied than they are not. Because when you inherit a collection, you become more aware of the logistical and unseen connections between all the collections of the libraries of the world through the magic of ILL, collaborative print, OA projects, digital libraries, etc. You will learn the greater context of your collection, and discover that it is endless in terms of the access you can facilitate. It’s an incredible time to be a collection librarian, as your inheritance is made greater through collaboration and cooperation. The collection is not defined by the boundaries of your library, the limits of your space or even your budget. This inheritance of yours, vibrant and expanding, demanding and impossible to know, it is yours only for a while. All around you are incredible materials- in some cases the life’s work people you may never meet, whose efforts are evident on every shelf on every subject guide on every list of databases. A collection is an incredible wealth, and you are the latest in a series of stewards. Your legacy will be forever intertwined with the work of unseen coworkers, past and future. Consider this resonance when you find a moment, perhaps in those challenging moments as you grapple with budget decisions or at after a difficult meeting with stakeholders. The timbre, deep beauty, and span of the collection is its own meditation. In such moments, remember again that you have inherited a great fortune, and others will inherit it from you. Be grateful and be gracious, collections require both. Lindsay Cronk is the Head of Collection Strategies, University of Rochester River Campus Libraries. This is the second time she’s written for LtaYL; the first was an interview. She tweets at @linds_bot. @olinj re: LTAYL have you yet revisited past posts where you would give different advice now vs then? I loved that idea, but haven't had a chance to revisit anything because stuff keeps coming up. However, in the lull between semesters and in between outrageous legislation, I decided to revisit the idea of whether or not shushing people in the library is a good idea. I have to admit that my advice isn't terribly different, but I do have more specific advice to give than I did in my original post. 1. I try to gauge my reaction based on others. I'm hyper aware of noise around me, for whatever reason, and am especially hypersensitive to noise in the library. If something is bothering me, but nobody else seems fussed, I let it go. 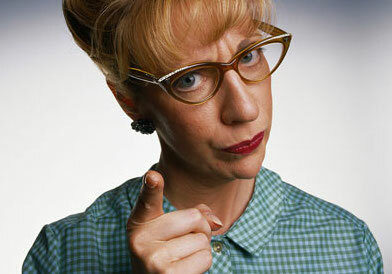 On the other hand, if I see annoyed expressions from students in the library, I go into action. 2. I work to make sure that people have different kinds of spaces in my library, if possible. Study rooms are ideal, but designating one part of the library for noise can also help keep things quiet. If all else fails, and the library is too small for those kinds of distinctions, making ear plugs available can help so much. 3. I keep the community served by my library and the time of semester/year in mind. Everything I'm writing here is down to the academic library thing. Like the fact that at the beginning of the semester, it is going to be loud. It just is. If it's during break, noise might be more noticeable but it's also less worrisome. During mid-terms and exams, though, when stress is running high...? I'm ruthless. 4. I try to be mindful of the shushing stereotype, but sometimes it can't be helped. Instead, I play into it for the humor of the situation. I remember telling a group of football players, at a previous job, "hey, don't make me be a stereotype and have to shush you." That worked for a while! Later that week I had to pull out the big guns - "don't make me tell your coach about this." Actually, humor is always a good method to get college students to be more considerate of other library patrons. 5. I don't take it personally when things get loud in the library. I mean, how can I take it personally when it's high stress making people act out? Or when a member of the staff laughs so loudly because they forgot for a second where they were? It's not meant as a personal attack, so I try to be kind and see it from the loud person's perspective. The approach has worked for me for years now. I've even been thanked by students for reminding noisy people that it's exams and people are stressed. It's a careful balance of letting things roll off while still paying attention, but it has been worth it. What about you? How do you approach noise in the library? 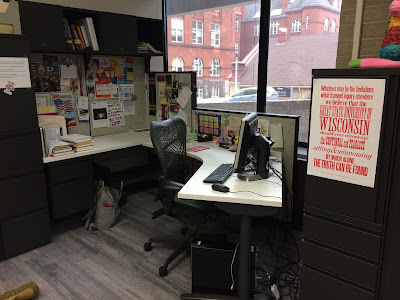 Public Services Librarian, College Library, University of Wisconsin-Madison. I started working in libraries in May of 2001, as a circulation clerk at a public library. I defended my Master’s thesis in December of 2007 and got my first librarian job in August of 2008, though that was the third library I had worked in. So it’s either 16.5 years, 10 years, or 9 years, depending on how you want to do the math. I have a shared office off of a large study room. It’s not a cubicle situation - we each have our own areas and have set up the space to give ourselves room and a sense of semi-privacy. I’m currently sharing an office with four colleagues: three postgraduate residents and one permanent staff member (who is my closest colleague from a responsibility standpoint). There’s a lot of variation in our schedules, so it’s rare that all five of us are in the space. We have an office agreement concerning things like noise levels, lighting, and greener use of the printer, among other things. We also have good conversations and a “queer kid’s dorm room in the mid-90s” aesthetic. I love us. Because the staff where I work have such a diverse range of responsibilities that require us to spend a lot of time out of our offices and elsewhere on campus, we are very dedicated to our online calendars. Between calendaring and the app Things on my phone, I tend to be where I need to be, when I need to be, with what I need to be there. The answer to this question varies widely depending on what part of the year we’re in. College Library is an undergraduate library, so most of my job is teaching, no matter the context. We refer to ourselves as a teaching library, and we mean that in a very comprehensive sense. We teach on the desk, we teach in the classroom, and we teach each other in meetings. I’m also one of the two supervisors of our graduate student employees. If it’s summer or early fall, I’m spending a lot of time training our new employees, refreshing our returning employees, and making sure administrative details have been taken care of so everyone gets paid and can sign in to the tools that they need to help our patrons. I estimate that I spend about half of my time teaching in one way or another - on our busy reference desk, in the classroom, at outreach opportunities, training and meeting with student workers. Regardless of the time of year, I go to a lot of meetings. I know it’s standard to heap scorn on meetings, but I love them. I’m a very verbal person and I think some of the best work gets done when everyone has a chance to reflect, share their expertise, and make a contribution to the decision-making process. I get up every morning around 6:45. My partner (who is also a librarian, also at the UW) and I get our daughter ready for school. One or both of us drop her off and then take the bus to campus. That part of my day looks the same every day, but that’s where consistency ends. The inconsistency is a big upside of librarianship for me - I don’t do well in work environments without a lot of variation. I’m usually teaching, in a meeting, or on desk before 10 am every day. Between scheduled responsibilities, I’m in my office, running down my to-do list, catching up on the news (serving early-career undergraduate researchers means that I need to be up on current political and cultural events if I stand any chance of doing my job well), and preparing for the next thing. Unbelievable, by Katy Tur. I just finished Disobedience by Naomi Alderman and I have Call Me By Your Name coming via ILL. In the spirit of resisting the librarian stereotype, I’ll push against this and broaden the question to media in general. I love Halt and Catch Fire and Insecure. You should watch both if you haven’t. I’m watching The Marvelous Ms. Maisel as fast as I can. I listen to Crooked Media podcasts and Unorthodox every week. I still own an 80G iPod Classic. The last things I listened to were Melodrama by Lorde and 1989 by Taylor Swift (mostly because my five-year-old asked me to put it on in the car). I don’t know if I can boil this down to one piece of advice or one experience. I think the way I’ve best been able to grow as a professional is having the privilege of working in close proximity to amazing thinkers and doers in our field and having a lot of space to talk with them and listen to them. As I write this, I’m thinking specifically of Hope Olson, who was my professor, thesis supervisor, and boss for several years while I was in library school. She taught me so much about rigor and about the uses of theory in a field that can be practice-oriented. I’m also thinking of Carrie Kruse, my current supervisor, who is serious about the value of reflection, regard for individual expertise, and putting a lot of time and effort into interrogating what a library is and what its responsibilities to its community are. The trajectory of my career has been about coming to understand how much I enjoy working with people. I have a particular interest in patrons and colleagues who are situated at an entry or exit relative to the library - new undergraduates, the families of new undergraduates, people who tend to be underserved or misunderstood by academic libraries (which definitely includes undergraduates), new LIS graduate students, and LIS graduate students who are on the job market. I love supporting people whose information needs have undergone a shift. I do a lot more public speaking, training, and generally getting in people’s faces about what they need and how a librarian might be able to help than I thought I would when I was in library school. When I’m feeling burned out, I alternate between threatening to open a bakery and going to rabbinical school. Anything where the assessment of my job performance hinges on selling things to people. My graduate student workers, past and present. All of them. Too many to count. At their heart, though, would be my overriding inclination to not pause long enough to find a useful way to apply my emotional reactions to things in a workplace setting. To be clear - this is not me making some nonsense argument equating being unemotional with being professional. I think our real goal, as professionals, should be to find ways to acknowledge our emotional and personal reactions to our work and make use of those reactions in a way that will do the most good for everyone involved. I’m getting better at it. I could get better still. Spending time with my daughter (she is five and brilliant and fascinating), cooking, reading, being fannish, sleeping. Dave Bloom (my partner, who has an interesting professional story) or any of my former graduate student workers (who are numerous and delightful - I can provide names). Learning to delegate is probably one of the hardest things I've had to do since moving up into administration. Honestly, though, I wish I'd learned how to do this long before - back when I was chairing a campus committee at my first job in higher ed or when I was coordinating the info lit program at my second. I was so busy trying to be polite and keep people involved that I frequently did way more than my share of the work. 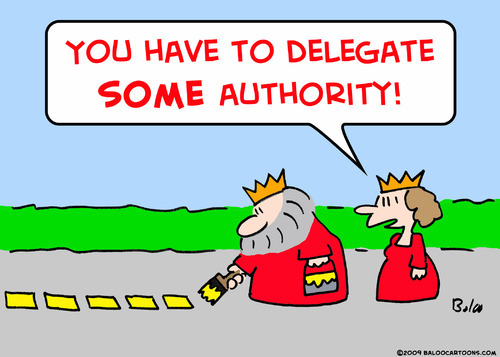 Delegating isn't easy, regardless, but it's actually a bit harder when you're the boss. It's basically learning to ask for help, but with the twist of a differential power dynamic. And since I'm in a bigger library now than where I was before, it's even more important. So, how do you learn to delegate? The first step is to acknowledge that you can't do everything. I know that might seem obvious, but it's hard to actually do. Everyone has so much to do, even at small and relatively quiet libraries, never mind at big and busy ones. But we're supposed to be a team, and we all have ways to make time for things that need to be done right now. The second step is to learn to ask without sounding like you're commanding, unless you need to. "Do you have time to take care of this today? I won't have time until tomorrow and I think it needs to happen today," is a good way to ask without commanding. "I know this isn't what you were planning to do today, but there's a looming deadline and we're all working on it, so I need you to work on this today," is a good way to be a bit more forceful without sounding dictatorial. Third thing is that you need to be willing to do some of the crap work. Someone once told me that every job you could ever have is a bit of a crap sandwich from time to time, so you need to find the crap sandwich you like the best. I've cleaned up huge messes. I've been the one to show up at 7:15 to make sure the library is open by 7:30. I've been the one to do a bunch of writing because others didn't enjoy writing. Finally, something that's always important but is especially important when you're delegating, is to give people the kind of support they want and AVOID MICROMANAGING. "The end goal is X, but I'm not worried about how you accomplish it," or, "The end goal is X, and so long as you don't do Y, it's all good." Also, "If you want more feedback than that, let me know, but I trust you since you've been working here a while," or, "I know you're new, but I trust your instincts, so let me know if you want more help but I'm comfortable with what you think is best." There have been times when I've had to hold people's hands a bit more, or when someone was so new that I didn't yet trust them, but those have been rare. I'm still working to get better at this. Just last month I was looking through my very long list of projects that I want to accomplish here and realized that one of them - that has been on my list since I started here - fits nicely with a staff member's strengths and interests. I'll get better, I know, because I don't take it for granted and I keep trying to improve. How about you? How do you delegate? Did I miss any major techniques/skills? Just For Fun: Fictional Librarians Revisited, or Oook! People who know me well, and therefore know that I'm unreasonably afraid of monkeys (it's an uncanny valley thing *shivers* erg), are probably going to be surprised when I tell you all that the Head Librarian of the Unseen University is my favorite fictional librarian. It's cool, though - he's an ape. 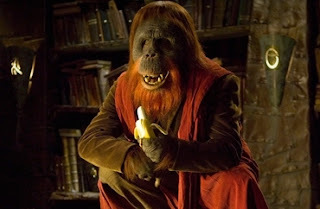 "Transformed into an orangutan by a wayward beam of magic, the Librarian is a member of the small, elite group who have the knowledge and ability to travel through L-space. His true identity is unknown and he speaks only through a series of “ooks” and “eeks,” but he’s still a pretty low-key guy when he’s not protecting the world’s knowledge. Just don’t call him a monkey. Trust us on that one." The Discworld series, by the sorely missed and dearly departed Terry Pratchett, is one of the finest examples of parody we have available. All the fantasy novel tropes - ALL. OF. THEM. - are held up for examination and destruction. The Librarian, in my opinion, is a take down and reexamination of the "noble savage" trope, but he's not noble. He's out to protect his own hide, the grimoires and other magical tomes in his care, and his pile of bananas. However, he is more in tune with the forces of magic than pretty much anyone you'll encounter in the Discworld novels. Or, at the very least, he's more wise and wary of them. He's not my favorite character in Discworld. That's probably Death, or maybe Granny Weatherwax. But when it comes to fictional librarians, this orangutan has got it all over the rest of them. How about you? Do you have a favorite fictional librarian? There's been a recurrence of the "ban laptops! it's pedagogy!!1!" bug floating around on social media lately, with people coming down solidly pro and con the idea of forbidding students electronics. I decided to write this short post because I want to take a moment to address a point that I haven't seen mentioned yet. Before I rant about my main point, I want to get a few things out of the way. I have to admit I banned electronics from my classroom early on when I was an adjunct, but I've since realized it was a mistake. Banning laptops and electronics from your classroom is beyond ableist. Also, if your classroom management skills are so bad that you have to outlaw an entire class of tools, isn't that more about you than about the students? But the thing that bothers me about professors waggling their fingers at students for laptop usage, that I haven't seen mentioned yet, is how infantalizing it is. Especially in the college classroom, aren't we talking about legal adults? Granted, you'll have an occasional high school student taking a class under a dual enrollment program or someone who skipped a grade or has a late birthday and sneaks in under the wire. But even those individuals know that it's a college classroom - geared towards people who are 18 or older. And if they're adults, old enough to vote and to die for their country, shouldn't they be responsible for their own behavior and suffer the consequences? It comes down to this: if you don't pay attention in class, you fail the test or the essay or whatever. If you fail an assignment, or even a class, you (hopefully) learn from your mistake and pay better attention in the future. I'll never forget the first F I got. It was in college, and it broke my heart, but I'd let my personal life get in the way of my studies and I had to pay the price. I came back so much stronger the following semester. Don't get me wrong - I respect academic freedom and acknowledge that each professor has the right to run their classroom, in general, the way they want. But! Banning laptops is wrong on so many levels. It's ableist and lazy and, without a doubt, infantalizing. I’m the Emerging Technologies Coordinator at Columbia University Libraries. Four years, if you count my assistantship work at the University of Michigan (which I definitely do). Living and working in New York City has given me an interesting perspective on space (in short: we never have enough of it); to get your own office, even in the libraries here, isn’t the norm. So I treat mine like my home away from home. As you can see, I’ve splashed the walls with artwork from my favorite comics, pictures of my family, memorable conference swag (my #PoCLibrariansAtWork and #BlackLivesMatter ribbons comfort me at eye level every day); I also display a watercolor painting I purchased from Monireh, an artist I met while strolling through the Villa Borghese gardens in Rome earlier this year. I put it up to keep a piece of my recent travels with me, and to remind myself that I’m privileged to be able to see the world and support aspiring artists near and far. This is nice because that’s pretty much my life goal -- to make and support art wherever I am! Alongside all that, I’ve got spur of the moment art purchases up too, like a selection of Georgia O’Keefe postcards; buttons and pins; stickers and totes; signed posters from some of my favorite comic book writers; you name it. Though all of this probably sounds like A Lot™, I see my office as a site of both resistance and reflection; a place where I get to challenge the professional norms that say you can’t bring your full self, or outside passions, into the workplace. So I recently started using the Pomodoro Technique, which has been very helpful for structuring my time and getting the most out of my day. This also lets me focus intently on work for a burst, then refresh with bite-sized breathers in between. In general though, mornings are for catching up and prioritizing; midday is for digging into large projects that need sustained amounts of my time and attention; late afternoons are for exploring, researching, or investigating new technologies. I try to stick to this format as much as possible, but of course there are plenty of days where this plan goes completely off the rails! Recently, big picture thinking. Columbia Libraries just underwent a large-scale strategic planning process, which saw (among many changes) me re-organized into a brand new division called Digital Scholarship. Since transitioning, I’ve spent a lot of time brainstorming ways to reimagine technological support, services, and programs in broader, interdisciplinary contexts. I also spend a fair amount of my time thinking about instruction and outreach, which happen to be my favorite parts of this job. It’s really hard to pin down a “typical” day, but lately it’s been a mish mash of handling email, scheduling consults with students interested in our microcontrollers (like the Arduino and Raspberry Pi) and virtual reality devices, delivering or planning for library workshops, working on grant-funded projects, and attending lots of meetings. SO. MANY. THINGS. I just started The Stone Sky by N. K. Jemisin, and I’m rotating that book with Crooked Kingdom for (somewhat) lighter reading. In the short fiction realm, I’m also reading Fireside Magazine (just finished the October issue and, hot diggity, was it good) and Fiyah: Magazine of Black Speculative Fiction. Find your people; it would be much harder to stay in this profession if I hadn’t connected with so many fantastic librarians of color through formal and informal networks. (POC libs, if you’re reading this check out We Here to connect with other POCs in closed group settings). Set aside time every day/other day for learning something new. It’s like setting up your own mini professional development goals, and could inspire whole new areas of inquiry. I try to do this as often as possible, and it’s really rewarding to catch up on the latest instruction or tech literature. Also, our time is valuable and we deserve taking time to better ourselves. Never thought I’d be working on large, grant-funded projects; it’s been interesting so far. I would love to be a graphic designer! Spending my day pouring over typography options, color palette ideas, and layouts sounds heavenly. Beekeeper. If you know me, you know I’m terrified of bees (and wasps or anything else that buzzes and stings), so I literally don’t know how those people do a job where the creature you are trying to care for or protect just jabs a part of its body into you because it doesn’t understand that you’re trying to help it. I have mad respect for beekeepers though. Teleportation would make my life so much easier. Second choice would just be outright flying. Maybe this is a cop out, but I’m really proud that I’m still chugging. [Editor's Note: Note a cop out.] This is my first role out of library school, so impostor syndrome was a huge thing to overcome early on. I’m happy to say that every day, I feel more and more like I deserve to be here. Early on in my position, I was asked to lead an internal professional development initiative to promote skills training among myself and other colleagues. I felt pretty in over my head and struggled to thoughtfully structure the experience. What helped, though, was acknowledging that I was in over my head; I actively sought feedback from my colleagues and asked them for suggestions on how to make the experience better. That meant being humble and embracing my mistakes. Often, I’m writing. I spend a lot of time working on short story drafts and novel outlines. I’m also one of those people who gets lost down internet rabbit holes like the cat videos section of YouTube :). I would LOVE to see the ever wonderful and dope likes of Rebecca Martin at Harvard and Nicholae Cline at IU Bloomington answer these questions! Recently, I was talking with a couple of friends about how hard it can be to find a mentor when you're no longer early career. When you're mid career, it's a little weird. Sure, you like where you are and what you're doing, but do you really want to stay forever? All three of us are the Head Cheese In Charge at our respective libraries, so there is no natural person to whom we can turn for mentoring. Or is there? As I started to write a general, "Gee, I don't know either," kind of response to the email chain, I realized I did have an answer. Since I'm so new in my job (both of my friends have been in their jobs for a while), how I started and handled my first three months is still so fresh in my mind. I worked to find the perfect mentor, but I didn't. What I did instead was... for lack of a better name, let's call it The Frankenstein Approach. What the heck do I mean by that? Well, the way I've found my mentor is to cobble together multiple mentors so that (almost) every piece I need is embodied by at least one person. I've got a couple of people I can turn to for questions about community college settings. There are a few who've been in libraries longer than I have and in administration on top of that. I have a couple who know my current institution - one who is my official mentor through the program Human Resources runs, and another who is just someone I can ask questions, and both of them are peers (all of us report directly to the provost). I have a couple of people who know western NY academia, too. Finally, I have a few peer mentors who just know me and my approach. Only piece I don't have yet is someone who knows SUNY, but I just agreed to be on a couple of committees that I'm hoping that will help me fill in that blank. This has worked for me so far. It's like... if I have a question about how to approach money centered issues, I turn to an old boss, whereas if I'm having personnel issues I can turn to someone who was formerly an "official" mentor but who has turned into a peer. If I'm trying to wrap my head around faculty relationships or anything else related community colleges, I can turn to one of a couple of contacts who are also directors at community colleges. If it's a very specific question about a dynamic I saw at a meeting on campus, I can go to one of a couple of people I trust on campus. And if it's about where my career should go, I turn to my peer mentors. In Part One I talked about to move from one part of the Big Tent of Librarianship to another. In this post, I’ve turned the focus on those on the hiring committee, the ones who decide who can join them in their part of the Big Tent. If you took a close look at your workplace, you will probably find that the majority of your coworkers share similar life and work experiences. They will probably look similar to you too. Unless you have the power and authority to definitively change hiring practices at your place of work, you might be wondering how you can make room for folks from other parts of the library field when you are just another search committee member. How do you sway the recruitment process to venture away from the cultural “fit” default? A major part as to why you see a homogeneous workplace is implicit bias. Implicit bias is about our attitudes toward stereotypes - both positive and negative - that are held on an unconscious level. While you might have worked on correcting attitudes and stereotypes you held in the past, chances are you only worked on the external bias that you hold, since external biases are easier to spot in everyday thinking and behavior. In short, you are biased, your search committee members are biased - and you all might not even know it. If you are sceptical that you are biased - even after all those hours and work you put in not being actively biased - take the test on the Project Implicit site. Implicit bias is a reflex that takes active, consistent work in recognizing and addressing over time on a personal level. 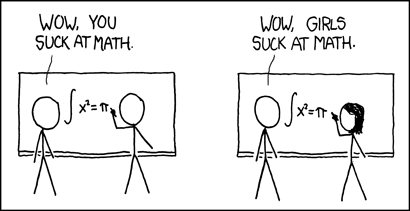 You have probably seen implicit bias mentioned in conversations about race, gender, age, and ability, but implicit bias also plays into someone’s judgement of another person based on their school or workplace. Combating the implicit bias present in the search committee can take on many forms. The first place to start is awareness - your HR or organization might already have an implicit bias training in place, or have a section on implicit bias in the materials that the hiring committee receives for the hiring process. If neither of those are the case, talking to HR and the hiring committee chair about addressing implicit bias in the hiring process will start the conversation in your organization. Moving on to the job post that your committee is drafting, pay attention to the tone of the post. Look at any key words or phrases are you using that might turn off qualified candidates from applying. Take this example phrase in a required qualifications section of a job post - “experience in an academic library”. Widening the net and changing the phrase to “experience in a library setting” (or another broad phrase) opens up the candidate pool to those who have the skills but not in the setting of an academic library. Another strategy to combat implicit bias is blind reviews. This will take some buy in from the committee and HR if your organization does not perform blind reviews already. Usually blind reviews take the person’s name or any gender or racial identifiers off of the application materials, and this is where a good portion of the literature regarding blind reviews focus on. Removing school and employment identifiers is not as commonly practiced as removing name, gender, or racial identifiers; nonetheless some organizations have taken that route. A non-library example of this is with an UK law firm who stripped out the names of educational institutions on resumes to ensure that the evaluators will judge the candidates on their skills and not the reputation of the school the candidates attended. Another company that specializes in the blind review process found that when they removed educational institution identifiers that applications from community college graduates rose 15%. You might not be in a position to have your HR department develop a blind review process. You might not even have a say in what the job posting says when it goes out to the public. In those cases, when you see candidates who have the skills and experience but not in “right” type of library, advocate! While it is on the candidate to ultimately show that they have the skills to succeed in the position, it is on the hiring committee to evaluate candidates without penalizing for experience gained at the ‘wrong’ part of the Tent. For a longer, related read about how racial bias has shaped our profession - including who is part of the profession - and ways to address this problem, I recommend Topographies of Whiteness: Mapping Whiteness in Library and Information Science. Becky Yoose is the Library Systems and Applications Manager at The Seattle Public Library. This is her second post for LtaYL. The first was "Fitting” into the Big Tent: The Role of “Fit” and Moving Between Library Types She tweets at @yo_bj.